Random Tuesday Thoughts: RESP ME! When I sit down to write my Random Tuesday Thoughts, I often feel Seinfeld-esque. It always seems to be a post about nothing. It’s amazing how difficult it can be for me to come up with a whole lot of nothing. Last week, a mongo SUV drove past me. The license plate read “RESP ME.” Do you think that means respect me? How can I respect you, Mr. SUV, when you’re weaving through traffic and talking on your cell phone? I caught up with him at the stop light. HA – guess I showed him! Today is my favorite day in February: Groundhog Day. (Oh, puh-lease, Valentine’s Day is simply too mushy and sentimental. Nobody really likes Valentine’s Day. Except for the chocolate getting part. I’ll give you that.) An article in the paper yesterday noted that some wildlife experts disapprove of Groundhog Day because groundhogs’ hibernation shouldn’t be interrupted. You know, for all of you who are going to go in search of a groundhog today to rouse him from his sleep. Don’t do it! The Chicago Tribune also felt it was necessary to report that groundhogs “don’t, however, predict the weather very accurately.” Um, yes, I think I figured that out. Thank you for your investigative prowess. 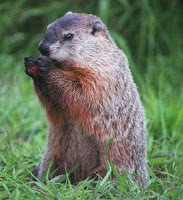 I absolutely adore groundhogs. I used to see them all the time when I lived out in the country. Just look at that groundhog up there – how could you resist that cute, pudgy little rodent? We watched Mary Poppins last week. Remember the ending song, “Let’s Go Fly a Kite”? This weekend, I bought the girls helium balloons for Lily’s birthday party. So all day they’ve been running around the house, their balloons flying behind them, pretending to fly kites. I absolutely adore my two girls. Even more than groundhogs. Even more than chocolate. ← Conversations Outside the Preschool Door: Has Breast Cancer Touched Your Life? 12 Responses to Random Tuesday Thoughts: RESP ME! I don't think I could "resp" him either with him weaving in an out of traffic.Hubby interviewed for a job in Punxy one time. That dang groundhog is every where ….there are shrines to him….statues of him made out of wood…paintings on the walls of convenience stores…the newspaper has him in their emblem. It was … creepy…. I've never really understood groundhog day! I find random days hard to comment on, so much going on. I still comment but it's just different for me. Love that song from Mary Poppins. Cute movie. Happy Birthday!!! I love the sound of music! My favorite song is "A Spoon Full of Sugar. "Have a great day! Happy Birthday! Valentine's Day is my daughter's b'day so even though I hate V-day I love her b-day. Makes not getting any chocolate or diamonds a-okay. And we have cake. They don't acurately predict the weather? What? LOL! He sure is cute, that groundhog. Happy Birthday!Are you sure you so groundhogs or prairie dogs??? We have lots of prairie dogs around here and the animal rights people think they should be considered nearly extinct and special and we should quit building so that we don't take over their land. Whatever.Anyway…groundhogs are cuter. I hope you get chocolate today AND for Valentines!